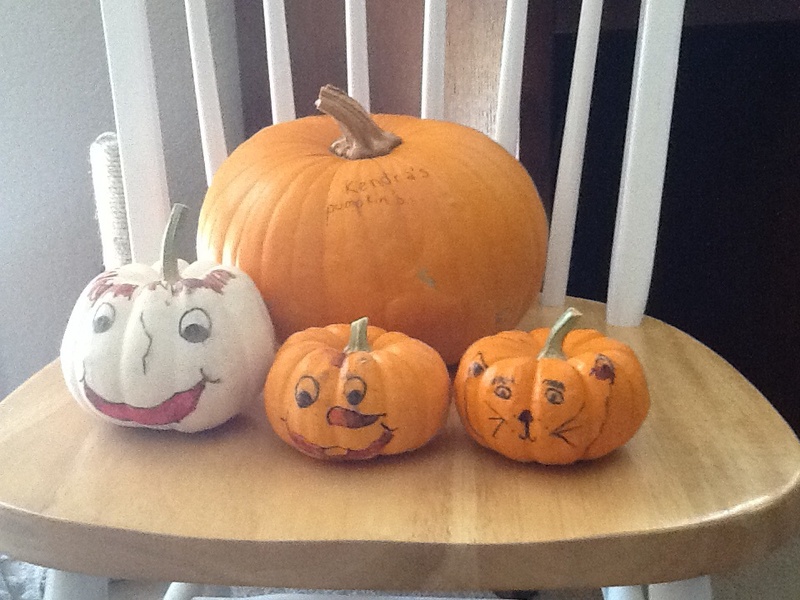 These are the pumpkins that my daughter decorated. From left to right the small ones are a self-portrait, Olaf from Frozen, and her cat Amy. She picked the bigger one at a Fall Festival and informed me that after Halloween, we need to scoop out the seeds and save them in a jar. Okay, sweetie! Here we are at the end of #blog-tober. I can’t believe I managed to write thirty-one consecutive posts…I hope I didn’t bore you. Thanks to my new followers! I will not be posting as frequently in November. The initial thought was to spend my writing time on a novel as part of National Novel Writing Month, but life has intervened and I will set that project aside for another time. I like the motivation that blogging brings to my craft time so I will aim for three posts a week over the next couple months. See you in cyberspace! We decided to be wild and crazy this summer and travel to Europe. I have a friend from college who lives in Hungary, so that was our destination. There were some lovely tile roofs in Budapest that are perfect patterns for a future hexagon quilt. In the little town of Papa, my friend took my to the local fabric store. I left my camera with my husband, but just imagine floor to ceiling bolts of everything, piles cascading onto the cutting table – cottons, vinyl, silk, knits, anything under the sun. The clerk was just as wild – orange hair and black leather pants. I wanted something that had a “traditional” Hungarian feel, so my friend directed me to these small prints. I am not sure what to make with them. Friendship stars maybe, with sunflowers, which are a big crop in Hungary. 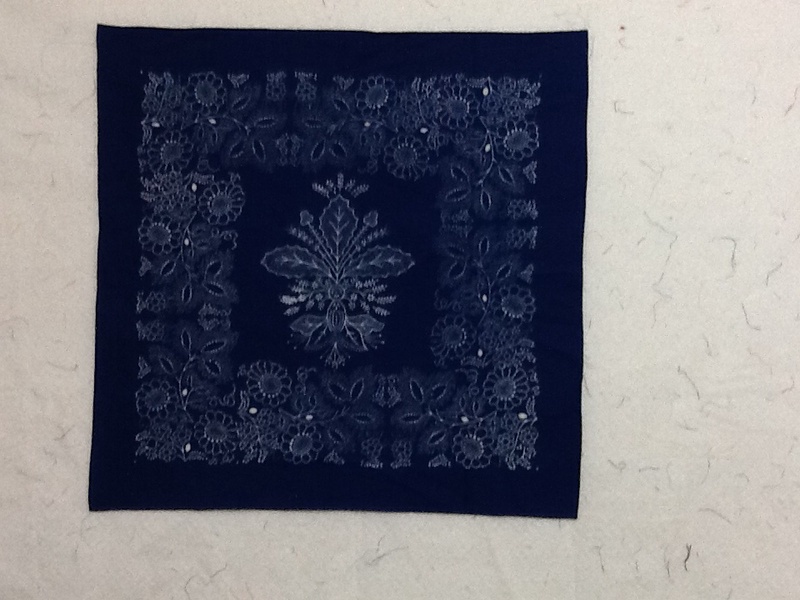 Another traditional fabric/craft is indigo dyeing. I found this small piece in a gift shop and it might become a pillow. What fabric souvenirs have you brought home from traveling? 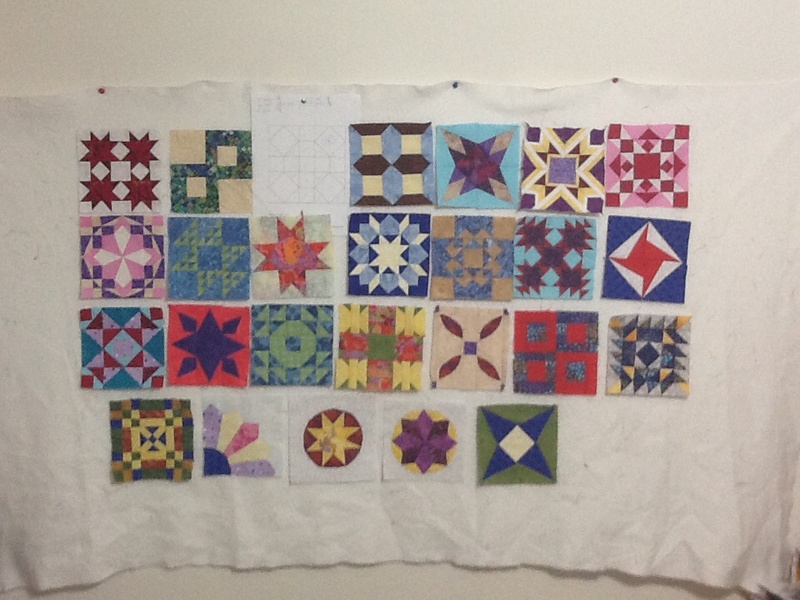 Before there were online quilt alongs, local shops would entice their customers with BOM projects – Blocks of the Month. 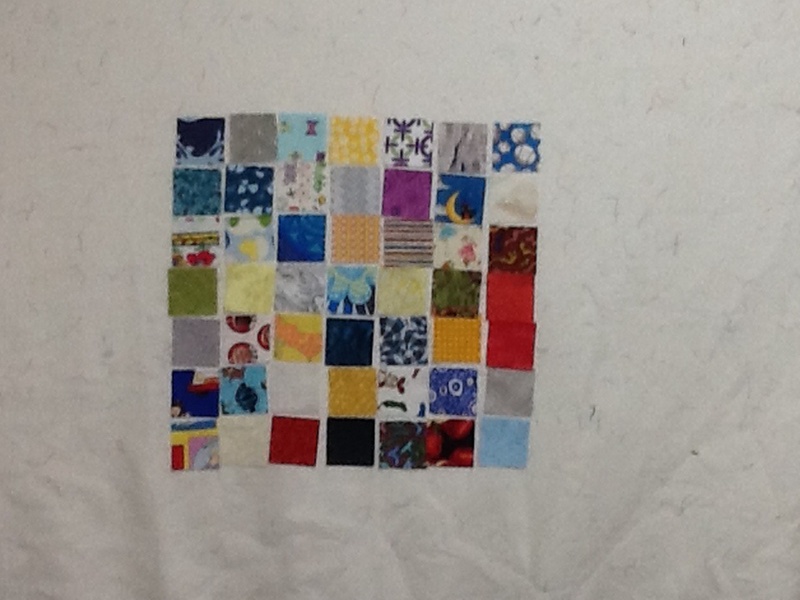 Many designers still offer these projects, and it’s a great way to tackle a large quilt. All it needs is a border! I stalled after putting the sashing on. 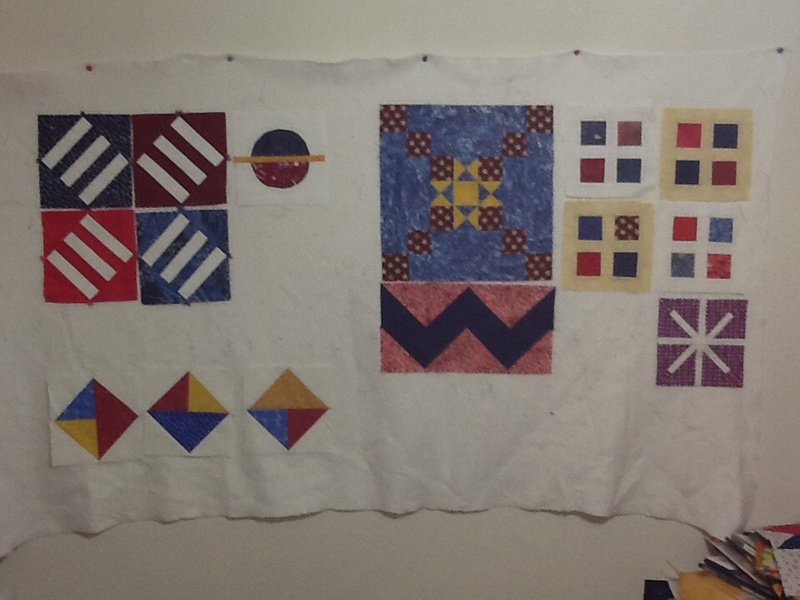 And the Block Lotto patterns from this year will make a nice QOV…I have seven months worth done. How old are your projects? 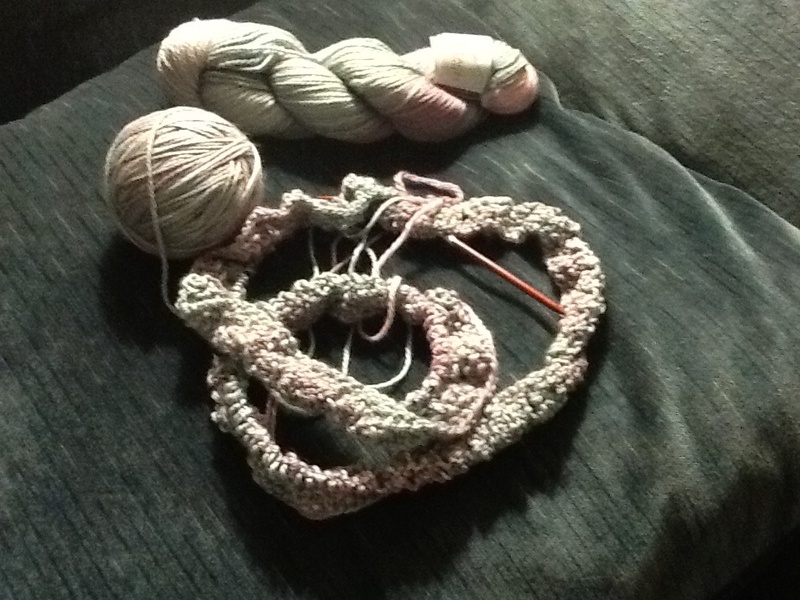 Would you start with the project that is closest to being done or whichever strikes your fancy? 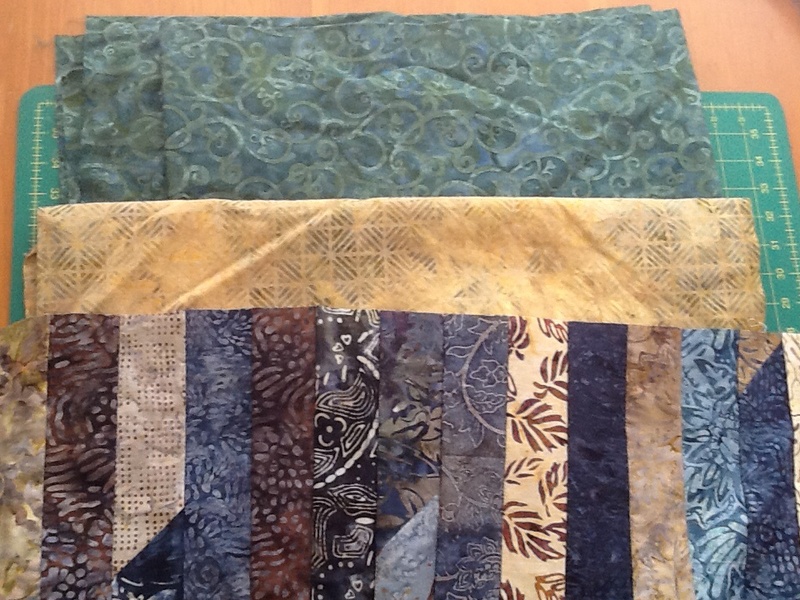 A quick and easy quilt pattern is the Jelly Roll Race. 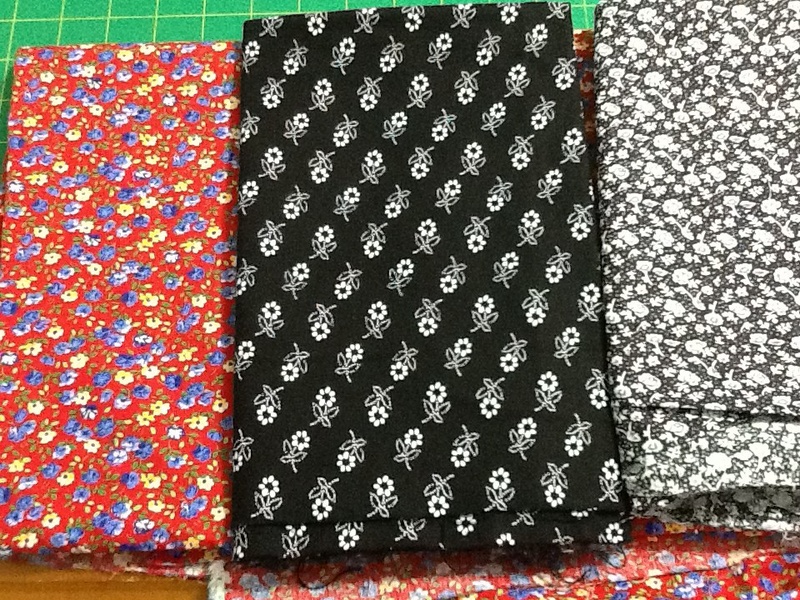 Jelly Rolls are sets of 2-1/2″ strips, usually packaged in groups of 40 to highlight a designer collection of fabrics. 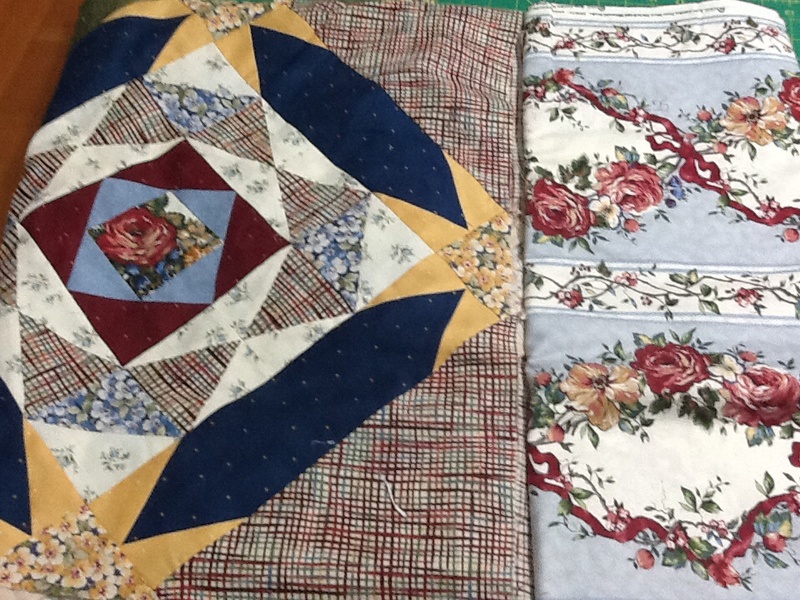 The race part came in when a group of quilters decided to see how long it would take to make a quilt from a jelly roll. The first step is to sew the strips end-to-end, creating a 1600″ length of fabric. 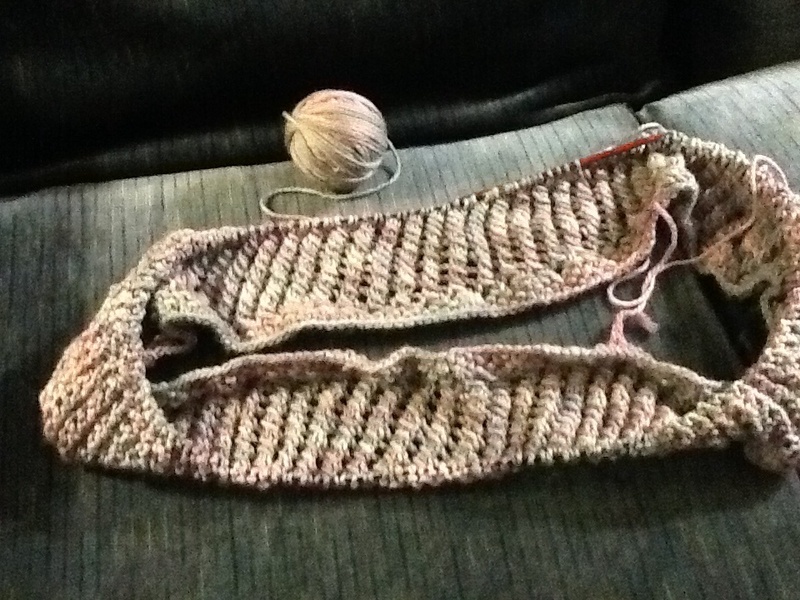 The strip is then folded in half and sewn along the long end. 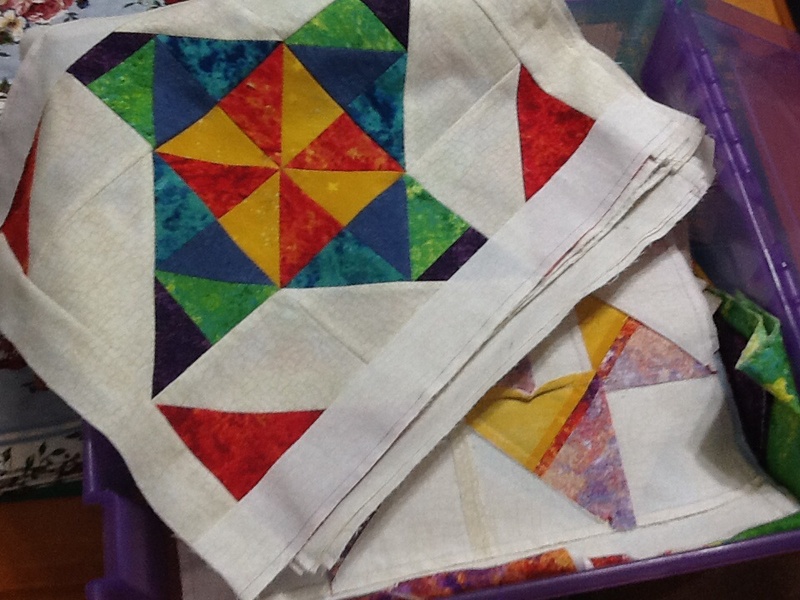 Repeat the process…folding and sewing, several times to create a lap-size quilt. This pattern is ideal for beginning quilters and charity efforts because you don’t have to worry about precise cutting and it goes quickly. 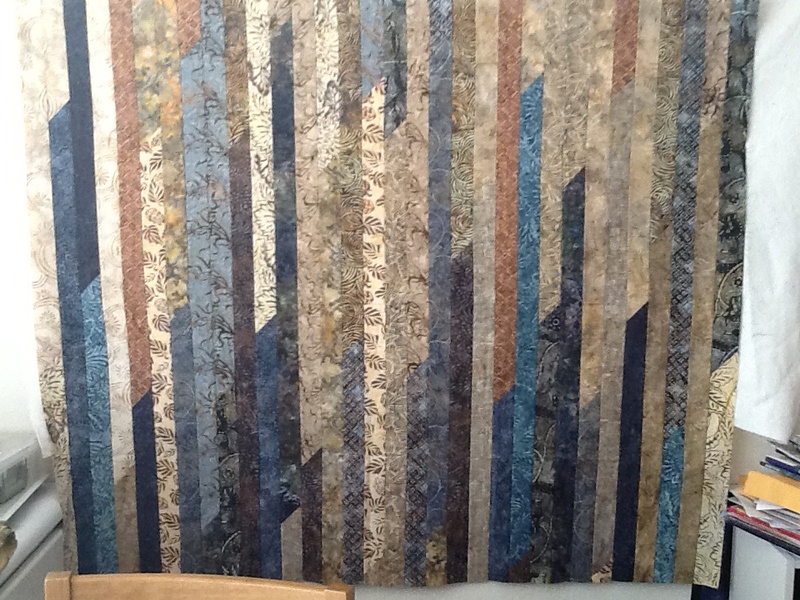 Once the strips are joined in step one, you can finish the quilt top (before pressing) in about 45 minutes. 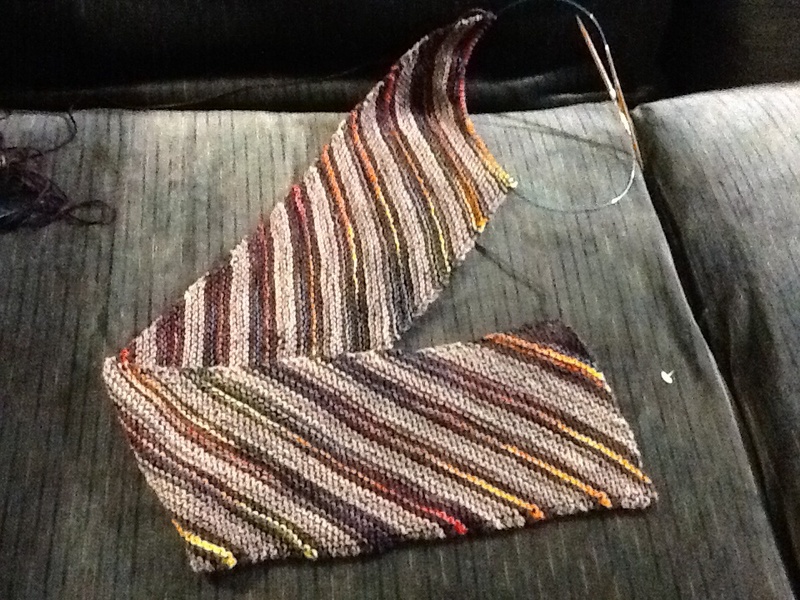 There are several variations – join the strips on a diagonal vs a straight seam, add spacer triangles or squares, slice two finished race tops in half to mix and match, etc. I chose a jelly roll with batik fabrics to make a masculine QOV top. It’s a little smaller than the recommended size, so I need to add some borders. 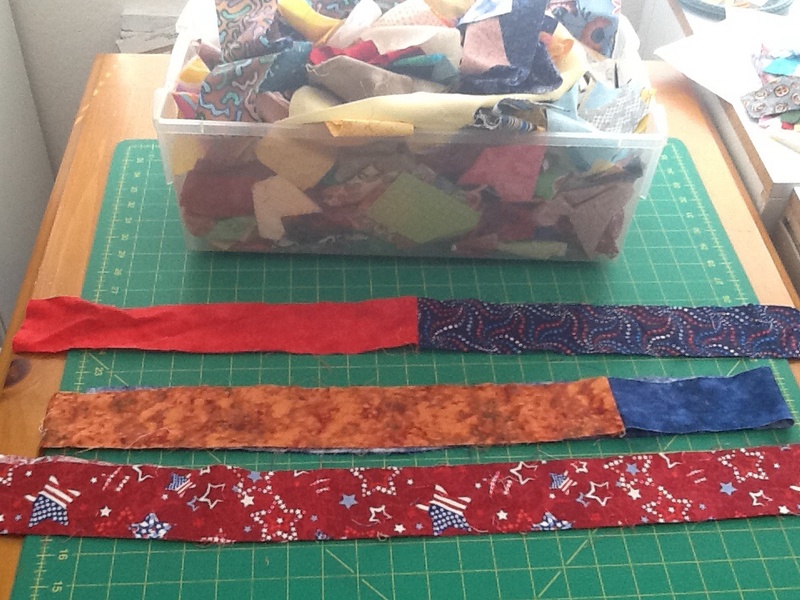 And, I can make my own Jelly Roll if I ever get my 2-1/2″ bin of scraps organized!